John Zorn likes to sleep at home. He doesn’t like critics. He likes to work. He doesn’t like it when people use the word “irony” about his work. (“They’ve been doing that for decades, and that’s f------ b---s---!”) He likes the idea of turning 60, which he will on September 2. 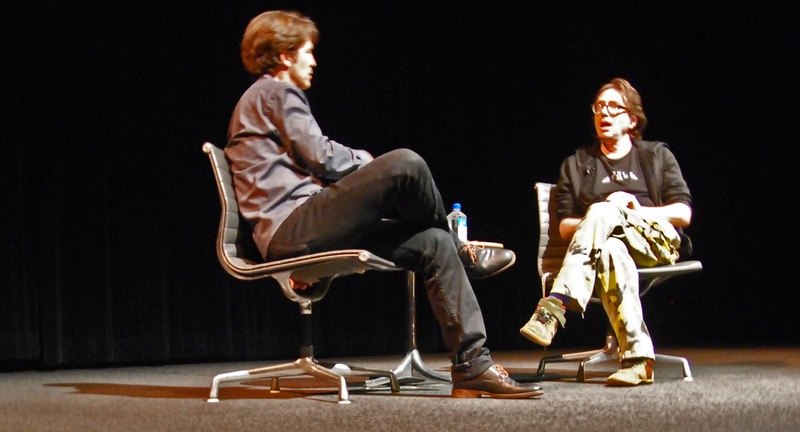 He doesn’t like taking questions from audience members, but he does enjoy talking with Philip Bither, the Walker Art Center’s senior performing arts curator and a longtime Zorn supporter and friend. 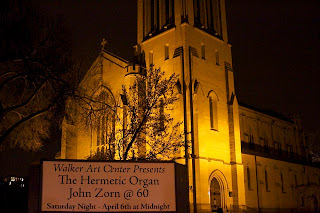 The day began at 3 p.m. in the Walker Cinema, moved to the McGuire Theater for performances at 4, 7, and 10 (each featuring music from a different time in Zorn’s career), and ended shortly before 1 a.m. at St. Mark’s Episcopal Cathedral across the street. It was an exhilarating, exhausting 10 hours (with breaks) during which we were given glimpses into Zorn’s life, music, nuclear energy, prickly personality, unbelievable prolificacy, and blast-furnace creative mind. Philip Bither (l) and Zorn. Photo by Bryan Aaker. Britt Robson, who previewed the Zorn-a-thon for the Strib, got good quotes from Bither, cellist Erik Friedlander (one of the musicians Zorn brought with him), and Tim Sparks (a guitarist who lives in Minnesota and has recorded on Tzadik), but not a peep from Zorn. So when I learned the day would begin with a public conversation between Zorn and Bither, I brought my notebook and scribbled furiously. 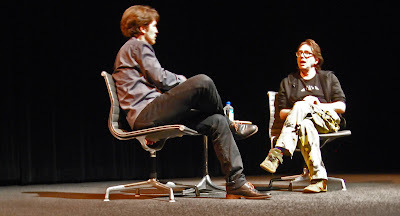 On record collecting (in response to a question from the audience): “I’m not a record collector. I’m an avid music maniac. I have about 15 thousand LPs, 12 thousand CDs, DVDs, books, art … I live in a library. I didn’t have a kitchen for 15 years, but I didn’t have cockroaches, either." The Zorn/Bither conversation was the ideal way to start the day Even though art is supposed to stand on its own and you shouldn't have to know anything about the artist to engage and respond (yadda-yadda, yawn), I found it very helpful. 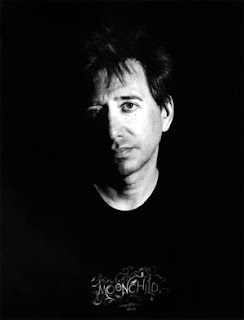 Zorn's words illuminated his music, and they reminded me throughout the day that everything I was hearing came from the mind of a slight, hyperactive, somewhat unkempt man wearing a black T-shirt and camo pants. The music was all over the place. 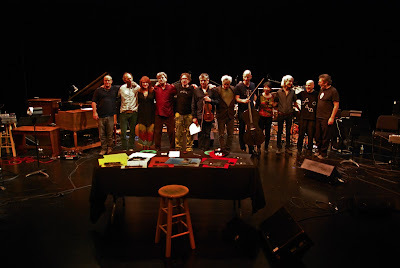 Organized chronologically, much of it was retrospective without sounding dated, and the musicians – all top players and Zorn regulars, most of whom he has worked with for years – approached each note as if it were brand-new. Zorn conducted most pieces from the stage (sometimes standing, sometimes sitting cross-legged on the floor), and I’ve rarely seen musicians pay closer attention or play with greater alacrity or joy. Often, Zorn responded to a particular passage or selection with a thumbs-up or a high-five. The Masada Trio. Photo by Bryan Aaker. Program II, “Masada,” began with Friedlander solo in selections from Zorn’s “Volac: Book of Angels, Vol. 8” (2007). Friedlander played his instrument (a gorgeous black Luis and Clark carbon-fiber cello) like a traditional cello, like an acoustic bass, like a guitar. 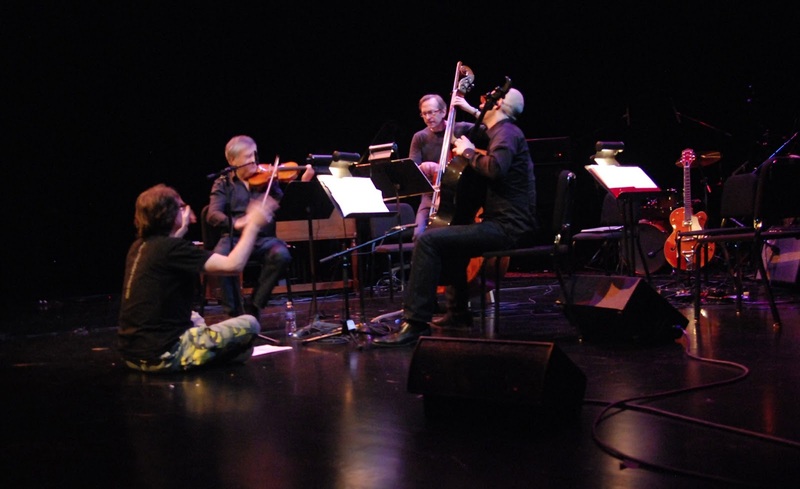 The Masada String Trio – Friedlander, violinist Mark Feldman, and bassist Greg Cohen, formed in 2003 to tackle Zorn’s extensive Masada songbook, his redefinition of Jewish music – performed richly melodic pieces comprised of themes and improvisations. The Bar Kokhba sextet, which dates from the mid-1990s, added Cyro Baptista on percussion, Ribot on guitar, and Joey Baron on drums for more Masada music. Later that day, many people said this concert was their favorite. The encore. Photo by Bryan Aaker. When the crowd rose to its feet and wouldn’t let him go, he went offstage, returned carrying his saxophone, and played one of his “Filmworks” pieces with Cohen and Wollesen, a blistering, screaming encore that lasted several minutes. 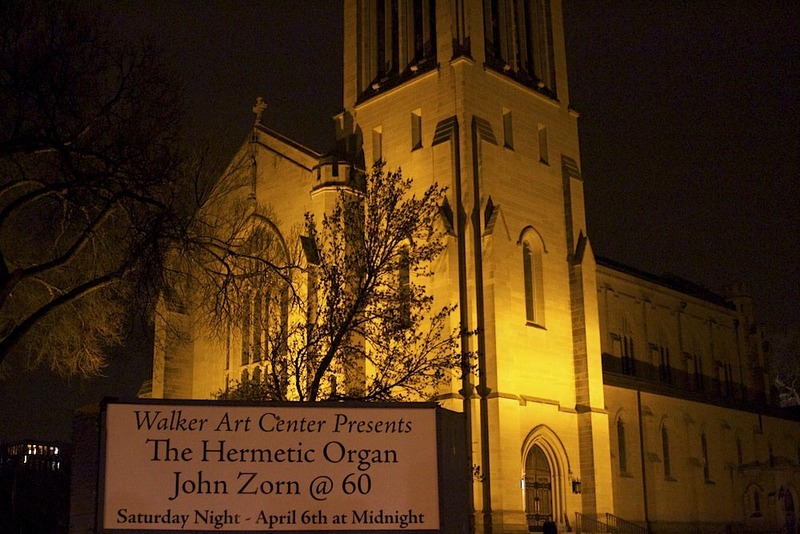 Originally, the three programs were the plan for the day, but Zorn likes playing the organ (he released “The Hermetic Organ” in 2012), and there’s a very good one nearby, recently rebuilt, at St. Mark’s Episcopal Cathedral. He wanted to give a late-night solo concert. St. Mark's. Photo by John Whiting. It was the perfect finale. The Cathedral hummed and vibrated. I almost expected cracks to appear in the stone columns, or dust to filter from the cathedral’s vaulted ceilings. Massive block chords and lovely melodies, chimes, drones, and what sounded like the thrum of giant machinery (wait, a pipe organ is giant machinery) kept the audience of hundreds enthralled. (347, according to Bither.) 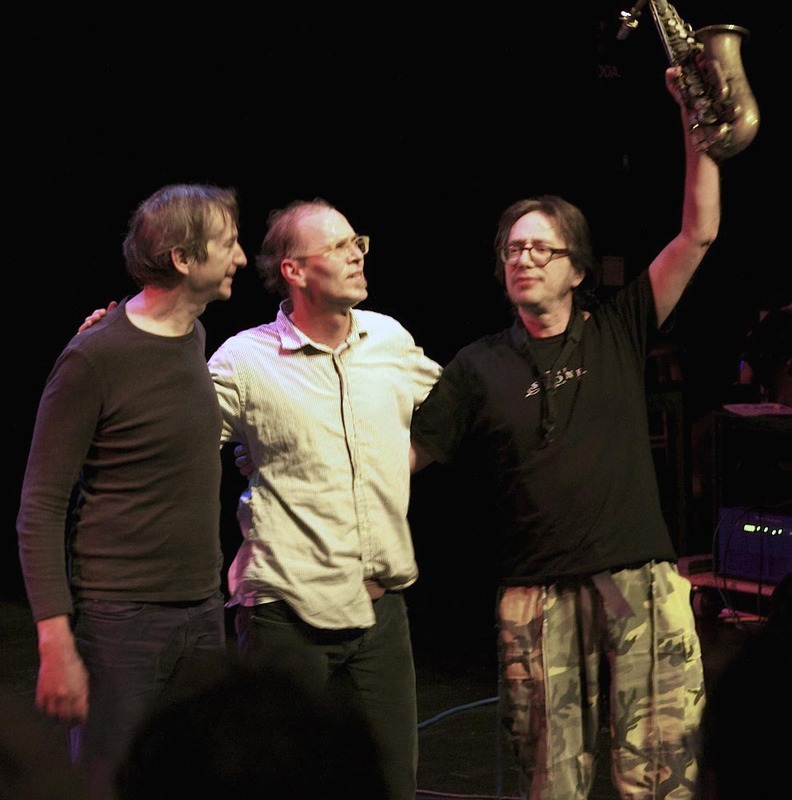 Many of Zorn’s chords included notes that had probably never met in that space before last night. It was dramatic, deeply spiritual and thrilling. Let’s start a movement. More improvised music in churches! Be free, big organs! The whole party. Photo by Bryan Aaker. Cohen, Wollesen, Zorn. Photo by John Whiting. I wasn't there but the encore thing could have been 'GoGoGo' from 'Filmworks XV11: Notes on Marie Menken'. 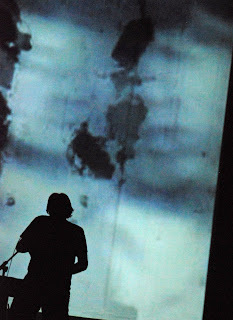 The encore was the Aleph Trio for the film Aleph by Wallace Berman. Great summary of the day. You came here from Oregon? I get that. I agree -- Joey's smile was incandescent. But all of the musicians looked as if they were having a wonderful time.